CREAM OF THE CROP: Stone and McFarlane announce the nine movies up for Best Picture. They’re here! 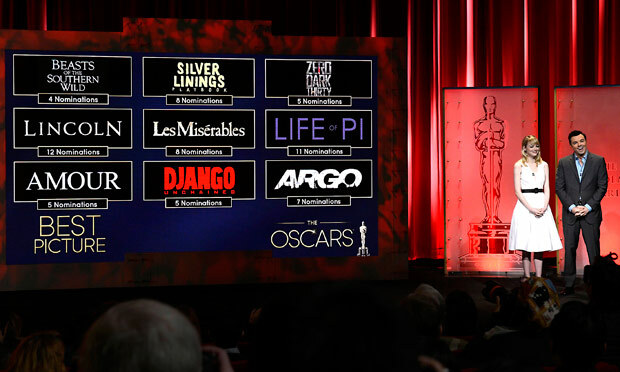 The nominees of the 85th Annual Academy Awards were revealed in Hollywood Thursday morning, and the long-awaited list came with snubs and surprises galore. Steven Spielberg’s abolition-of-slavery drama Lincoln led the pack with 12 nominations, including nods for Best Picture, Best Director and acting recognition for its stars Daniel Day-Lewis, Sally Field and Tommy Lee Jones. Ang Lee’s page-to-screen adaptation Life of Pi followed closely with 11 bids. Yet while the world celebrated with those who landed nominations, much talk centred on the glaring snubs, chief among them the omission of directors Ben Affleck (Argo), Kathryn Below (Zero Dark Thirty) and Tom Hooper (Les Misérables). But there were some delightful inclusions on the list such as Best-Actress nods for 9-year-old Quvenzhané Wallis (Beasts of the Southern Wild), 85-year-old Emmanuelle Riva (Amour), and Naomi Watts (The Impossible), as well as a well-deserved original screenplay nod for John Gatins for Flight and songwriting recognition for Adele (Skyfall). 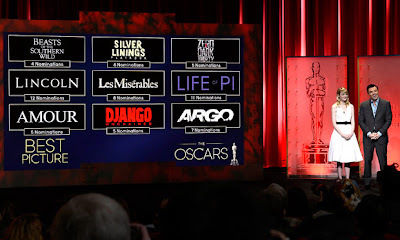 The 2013 Oscars will be presented on Sunday, February 24, at the Dolby Theatre at the Hollywood & Highland Center. Comic Seth McFarlane, who announced the nominees alongside actress Emma Stone, will serve as host of the star-studded ceremony.